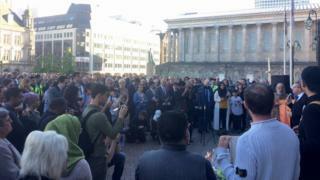 Hundreds of people gathered at Birmingham's' Victoria Square for a vigil to remember the 22 people killed and 64 injured when a suicide bomber blew himself up at the Manchester Arena on Monday night. The vigil was later disturbed when a man carrying weapons was arrested nearby. Before that crowds gathered outside the council house, where a civic dinner after the election of the city's new mayor Anne Underwood, was due to be held. Candles were placed in jars and a minute's silence was held as well as speeches from leaders of several faiths. People gathered around the council house entrance and numbers were swelled as more people, many making their way home from work, stopped to listen. Some sat in the sunshine near the flowers planted in the square's 'Floozie in the Jacuzzi' statue. The Bishop of Birmingham, David Urquhart, said it was "appalling" for the victims and their families to find "this murderous suicide in them middle of a wonderful evening". Barbara Anderson, 66, from Kings Heath, said she was there with her daughter Carol Cockerill and granddaughter Lauren. "I was gutted when I heard the news - we have family in Manchester and I needed to make sure they were safe," Ms Anderson said. "They were, thankfully. I don't go to big concerts but Carol's sister, does... You just have to hope they will be safe. "This made me angry- I have spent the day watching the news and went to the gym - good way of working off the anger. Ms Cockerill added: "We attend major events and something like this will not stop us going or think twice. The message from all speakers at the event was "we are one", BBC News reporter Kathryn Stanczyszyn said. The crowd was encouraged to chant those words together at one point. Andy Street, West Midlands mayor, told BBC News that he was very proud to be at the vigil to show "we are utterly united in defiance of what has happened". Zeshaan Ali from Hodge Hill, a volunteer co-ordinator for Islamic Relief, went with his nine-year-old son Musa and daughter, Juwayriyah, 11. "I have two kids myself- no family should have to go through what happened yesterday," the 33-year-old said. "Also, I'm from the Muslim faith. I want to show terrorism does not exist within a religion. "We go for days out, to the Bullring or the park on a sunny day - the same thing as going to a big concert. We like to think it is safe wherever you go with your family. "I heard the news when I woke up - it was sickening to hear it... Our prayers go out to those who have lost loved ones." Jessica Foster, 47, a vicar from Kings Heath, 47, said it was important to stand together and show "we will not be divided by those who want to maim and murder". "In Birmingham we connect no matter what your faith, ethnicity or wealth. We want to show our solidarity with Manchester," she said. Saraya Hussain, 40, from Balsall Heath added: "It resonates with you as a parent. So how can we contribute and share in their grief? We came here to say we will not allow it to divide us." As the vigil drew to a close at about 07:10, shouts from around the side of the council house building could be heard. Police declared a security alert and cleared the square, but there was no panic. People simply drifted away. Police later said the man, already known to them and thought to have mental health issues, had been charged with possession of a sharp or pointed article in a public place, resisting or obstructing a constable in execution of his duty and possession of an offensive weapon.